A video for the unreleased and mostly unseen game Mail Plane for the Vectrex video game system has been uploaded to Youtube. Further, the game is currently for sale, as part of a large ebay lot. 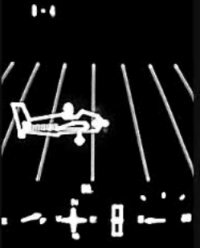 Mail Plane is an important historical footnote for Vectrex enthusiasts, as it is the only title designed to only be playable with the Light Pen attachment. 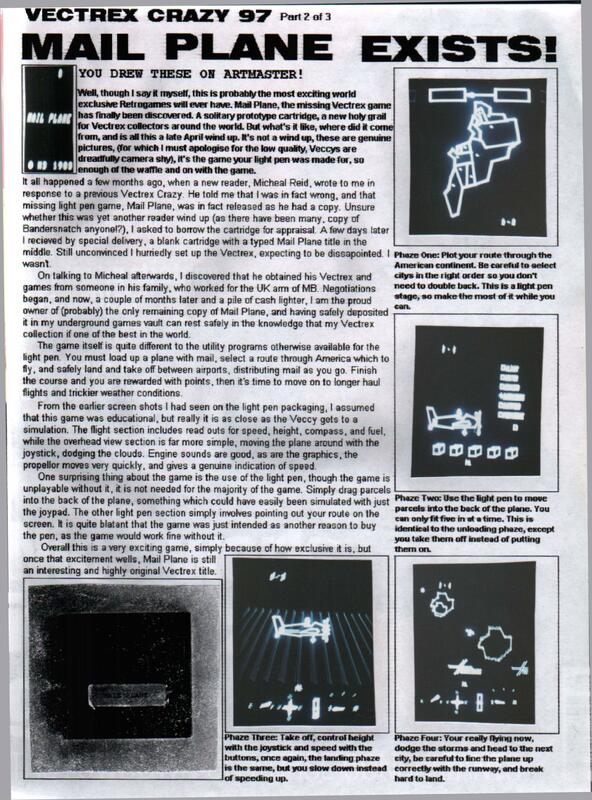 This is not the first copy of Mail Plane to surface - an article in a 1997 issue of Retrogames contained a review of what appeared to be final code, noting that the game is “as close as the Veccy gets to a simulation.” This was apparently one of two known copies, with one being held at a $5,000 ransom by a collector, as this dramatic discussion details. Oddly enough, there is a binary ROM floating around for Mail Plane that does not seem to boot properly. If recent discussion is to be believed, it may be corrupt and unusable, making the aforementioned auction the best and possibly last chance for a Vectrex fan to save this game from complete obscurity. The auction has plenty of other EPROM chips and prototype cartridges too, including a handful that do not boot (some without labels!). The unreleased games include Tour de France, Dark Tower and Pitcher’s Duel, all of which had previously been preserved in playable fashion, and Berzerk II, Mine Storm III and possibly others that are brand new discoveries - I don’t know my Vectrex stuff enough to tell for sure. The embedded YouTube video for Mail Plane is below. I have also mirrored the original video, because I don’t trust YouTube as an archival source. Who knows, we may never see this game in action again, depending on who ponies up the cash for this lot. If anyone wants to put together a pool to make sure these games are properly documented and saved, let us know in the forums link below.